Let’s review the bidding on whether or not the United States is seriously making an effort to prevent war in Gaza and perhaps beyond, with at least seventy-six Palestinians already dead. 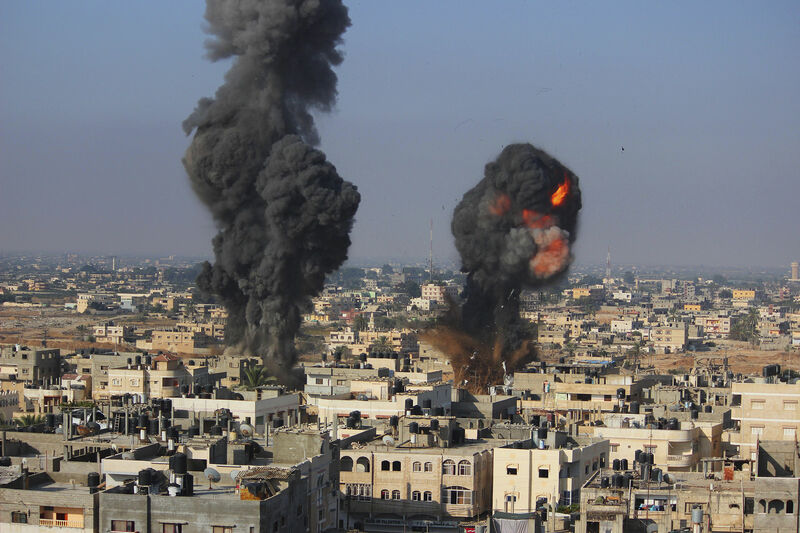 You’ll recall that in 2009, just before President Obama took office, President Bush and Secretary of State Condoleezza Rice pretty much let Israel run amok in Gaza. Is the Obama administration doing any better? Well, let me start by saying that we strongly condemn the continuing rocket fire into Israel and the deliberate targeting of civilians by terrorist organizations in Gaza. No country can accept rocket fire aimed at civilians, and we support Israel’s right to defend itself against these vicious attacks. At the same time, we appreciate the call that Prime Minister Netanyahu himself has made publicly to act responsibly. We’re concerned about the safety and security of civilians on both sides. This means both the residents of southern Israel who are forced to live under rocket fire in their homes and the civilians in Gaza who are subjected to the conflict because of Hamas’s violence. As you know, Secretary Kerry spoke with Prime Minister Netanyahu a couple times over the weekend and reiterated the United States’ concern about escalating tensions and our willingness to engage robustly in helping to stop the rocket fire and restore the 2012 ceasefire as soon as possible. So these kinds of consultations are ongoing. It is not in the interest of either side for this violence to continue and even to escalate. So we are hopeful that even as Israel exercises their right to self-defense that they’ll leave open a channel for diplomacy to prevail and for a ceasefire or at least a de-escalation in the violence to commence. MS. PSAKI:—rocket attacks launched by a terrorist organization that is based in Gaza and the right of Israel to defend itself. At the same time, as you know, we work closely with the Palestinians. We work closely with the Israelis. And it’s important at this point in time to see if all sides can take steps to de-escalate. QUESTION: Do you have anyone on the ground in Gaza that can monitor the situation? MS. PSAKI: Said, I think we are concerned about any humanitarian suffering around the world. As you know, that isn’t about sides. That’s about what’s right morally. But with the crisis escalating just two months after formal US-led peace talks between the Israelis and the Palestinians collapsed, the White House isn’t preparing to dispatch Mr. Kerry to the region to broker a cease-fire, these officials said. Obama administration officials argue that this deterioration proves that it was right to pursue a comprehensive Israeli-Palestinian peace settlement. In our view, the failed US effort, with its tight timetable and disregard for the obvious unwillingness of leaders on both sides, merely raised expectations that could not be met, making a backlash inevitable. What’s needed is not another diplomatic blitz but a more patient, incremental and sustainable effort to restore trust between Israelis and Palestinians, improve economic conditions in the West Bank and Gaza, and create the foundations for an eventual settlement. That is if the fire in Gaza can be put out. At the Electronic Intifada, Medea Benjamin urges President Obama to visit Gaza. But the chances of that happening are about as high as the chance that Obama will preach from the mosque in Mosul, Iraq, where the head of the Islamic State in Iraq and Syria just appeared.